Taking one of the stellar Grand Canyon South Rim Tours is a perfect way to see and experience one of the world’s Seven Natural Wonders. These excursions are ideal for all types of people from singles to families to couples and groups. You can experience the Grand Canyon in a variety of ways that range from a comfortable touring coach to a small group Sprinter to flying in an airplane. Once at the park, you visit the most important lookouts like Mather and Yavapai Point as well as the Grand Canyon Village. If that’s not enough you have several add-on options like an IMAX movie, a Hummer ride through the canyon and you can soar high above the Colorado River during an interesting helicopter flight. 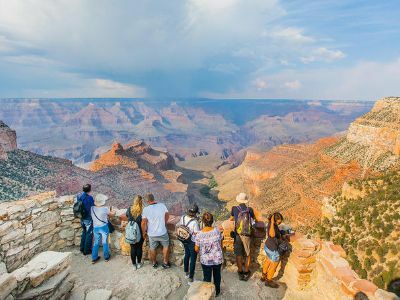 No matter what you want to see at the Grand Canyon, these tours will have you gazing out over the marvelous landscape that is truly one-of-a-kind in the world. 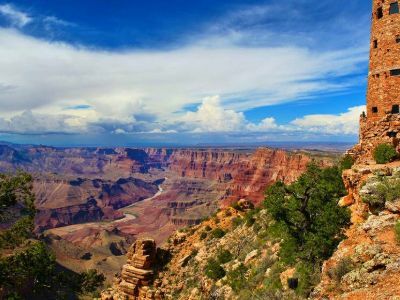 The Grand Canyon Connoisseur Tour is a perfect way to visit one of the world’s Seven Natural Wonders where you can view some of the most incredible natural landscapes. Your 9.5-hour Grand Canyon South Rim Tour begins with complimentary hotel pick-up service where you will be driven to the Boulder City Airport. From here you will board a customized sightseeing airplane and meet your pilot who will relay interesting facts of the places you will fly over. Once in the sky, you will soar above such magical places as the Hoover Dam, Lake Mead and the Mojave Desert before your eyes pop with the first sight of the Grand Canyon. After you land, you will be taken to the National Geographic Visitor Center where you will learn more about this special place and watch an IMAX movie entitled “Grand Canyon: the Hidden Secrets.” When you finish with the movie, you board a comfortable coach again and drive along the South Rim where you will have breathtaking views of the canyon that plummets one mile deep and at points along the way is more than eleven miles wide. 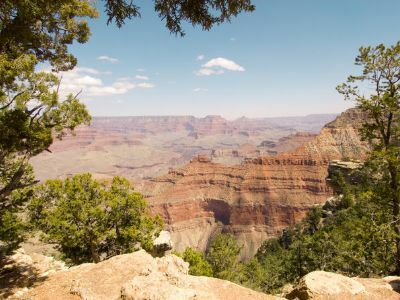 You will have plenty of time to explore, hike and take in the sights like Mather Point, Yavapai Point and Bright Angel Lodge as well as indulge in a free box lunch. Your exciting day at Grand Canyon concludes with a flight back to Boulder City Airport where you will then be transported back to your Las Vegas hotel. One of the best Grand Canyon South Rim tours which combines a scenic drive, an IMAX movie and plenty of time to explore the park is the Platinum South Rim Tour. Your 13-hour adventure begins with complimentary pick-up service from your hotel and then a light breakfast before you board a luxury coach. As you drive to the national park, you can take in views of the Mojave Desert as you relax and listen to interested commentary about the exciting places you will see at the Grand Canyon. Your first stop at Grand Canyon National Park will be the National Geographic Visitor Center where you will enjoy a light lunch and watch an IMAX film entitled “Grand Canyon: The Hidden Secrets.” From here you will take a short drive in the park where you will be treated to incredible vantage points such as Mather Point, Yavapai Point and you will visit the historic Bright Angel Lodge. This part of the Grand Canyon is an excellent place to take photographs where you will experience some of the deepest gorges that plunge one mile down. Your perfect day at Grand Canyon National Park concludes with another relaxing drive through the Mojave Desert and free drop-off service back at your hotel. The Grand Canyon South Rim Bus Tour with Optional Upgrades allows you to pick and choose some exciting upgrades where you can ride in a Hummer, soar in a helicopter or watch a stunning IMAX movie that explains the history of the Grand Canyon. Your 14-hour adventure starts with complimentary pick-up service from your hotel where you will meet your expert guide and board a comfortable touring coach. As you drive you can listen to interesting commentary about the history of the area as your eyes pop while looking at the gorgeous scenery of the Mojave Desert. When you arrive at the park you will spend 1.5-hours at superb viewing places like Mather Point, Yavapai Point and there is an additional 1.25-hour at the National Geographic Visitor Center which is packed with intriguing exhibits of one of the world’s Seven Natural Wonders. This excursion gives you the option to add-on several stellar upgrades. Upgrades range from a 25-minute helicopter flight over the canyon and a 2-hour Hummer ride to Duck on a Rock and Moran Point or there are options like watching the IMAX movie at the National Geographic Visitor Center as well as a 2-hour Jeep ride through the amazing landscape combined with the IMAX movie entitled “Grand Canyon: The Hidden Secrets.” Your great adventurous day concludes with a comfortable ride back to your Las Vegas hotel. 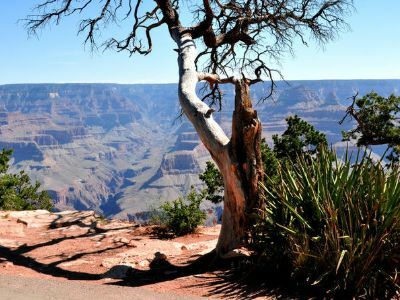 If you are looking for a Grand Canyon South Rim tour that includes stops at several of the most famous lookouts, then you should try the Grand Canyon National Park VIP Tour. This 14-hour journey to the one of the world’s Seven Natural Wonders begins with free pick-up service at your hotel where you will then be transported along historic Route 66 with stops along the way at Hoover Dam, El Dorado Canyon and the Route 66 Train Museum in Kingsman, Arizona. Once you arrive at the national park, you will be given 3-hours to explore on your own or with your guide. You can choose to walk the 2.5-hour Mather Point Trail where incredible vistas make for perfect photographs of the canyon that dives one mile down to the Colorado River. There is a complimentary box lunch included that you can eat while taking in the sights at Yavapai Point before making your way to the historic Bright Angel Lodge and Grand Canyon Village. This exciting excursion concludes with a soothing drive back to Las Vegas where you will be dropped off at your hotel. A perfect excursion to the Grand Canyon that includes plenty of scenic landscape and time to explore is the Grand Canyon South Rim Day Trip from Las Vegas with an Optional Helicopter Tour. Your 12.5-hour adventure begins with complimentary pick-up service at your hotel where you will meet your guide and board a customized comfortable touring coach. As you drive to the park along historic Route 66, you will be amazed at the beauty of the Mojave Desert while you snack on a light breakfast. When you arrive at Grand Canyon National Park you will have three hours to explore this magical place carved by the Colorado River. There will be plenty of time to take photographs of the canyon that plunges down one mile at spots. You can visit the National Geographic Visitor Center to learn more about the history of the area and geologic formations of the canyon. 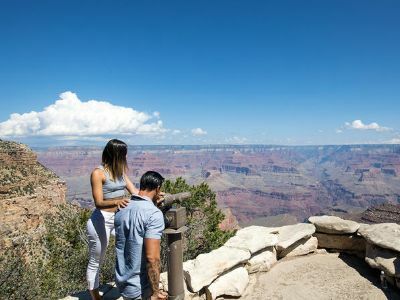 While at the park you will dine on a free box lunch and view the canyon from vistas at Mather Point and Yavapai Point before heading to the Grand Canyon Village where you can walk through the historic Bright Angel and El Tovar Lodges. If you are seeking more adventure on your excursion you can include a 45-minute helicopter flight over the canyon where you will have incredible views of the Colorado River, the Dragon Corridor and the Kaibab National Forest. Your fabulous excursion to the Grand Canyon concludes with a relaxing ride back to your Las Vegas hotel. 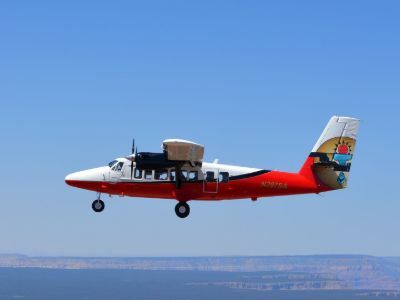 One of the most exciting ways to view the Grand Canyon that mixes a flight with plenty of time at the park to explore is the Deluxe Grand Canyon South Rim Airplane Tour. This 7-hour Grand Canyon South Rim tour begins with complimentary pick-up service from your hotel where you will be transported to Boulder City Airport. Here you will meet your expert pilot and guide before boarding a customized sightseeing airplane. As you fly to the canyon you will be treated to sights along the way that include the Mojave Desert, Hoover Dam and Lake Mead. When you arrive at Grand Canyon National Park there will be plenty of time to hike the Mather Point Trail, take in the National Geographic Visitor Center as well as stroll through the historic Bright Angel and El Tovar Lodges. During your time at the park, you can dine on a free box lunch and you will have several opportunities to take breathtaking photographs of some of the world’s best vistas from numerous prime viewing spots along the canyon. There is a stunning add-on option available on this tour which is a 55-mile helicopter flight over incredible scenic areas within the canyon like the Tower of Ra, Kaibab National Forest, the Dragon Corridor and the Colorado River. Your fabulous day at Grand Canyon National Park concludes with another thrilling flight back to Boulder City and drop-off service at your hotel. The South Rim Grand Canyon Tour is a fabulous excursion that takes you to one of the world’s Seven Natural Wonders where you can experience the beauty of a unique landscape. 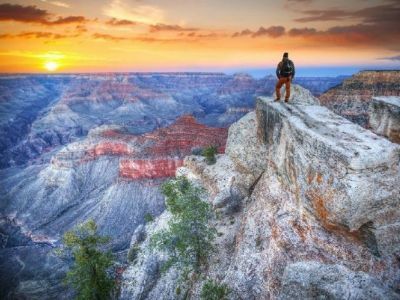 This exciting 12-hour Grand Canyon South Rim tour starts with free pick-up service from your hotel where you will meet your expert guide and dine on a light breakfast before you board a comfortable touring bus. As you drive to the national park, you will take in views of the Mojave Desert while you listen to interesting commentary from your guide. You will stop at the Grand Canyon Railway and indulge on a buffet lunch before entering the park. Once at Grand Canyon National Park you will be afforded plenty of time to explore this gorgeous place formed by the mighty Colorado River. During your time spent at the park, you can decide to take a stroll along the 2.5-mile Mather Point Trail where you can take some incredible photographs of breathtaking scenery. Your adventure continues by walking through the Grand Canyon Village where you will find interesting shops and the historic Bright Angel as well as El Tovar Lodges. There is also time on this excursion to view the exhibits at the National Geographic Visitor Center. Your excellent adventure concludes with a soothing drive back to Las Vegas and free drop-off service back at your hotel. When you want to get in a little exercise and experience some breathtaking scenery, then you should try the Grand Canyon South Rim Hiking and Bus Tour. 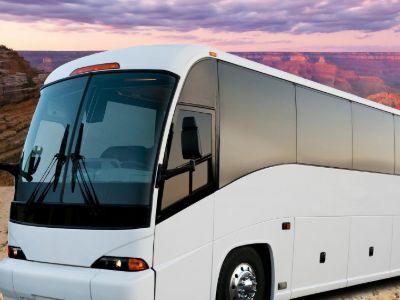 Your 12-hour Grand Canyon South Rim Tour starts with free pick-up service from your hotel where you will then be transported in a comfortable coach to the one of the world’s Seven Natural Wonders. Along the way you will make a quick stop at the Hoover Dam for some quick photographs before driving through the Mojave Desert to Grand Canyon National Park. Once at the park, you have the opportunity to stroll through the National Geographic Visitor Center which is packed with intriguing exhibits about the formation and history of the canyon. After this you will have a chance to hike the 2.5-mile Mather Point Trail along the South Rim where you will have great vantage points of the Colorado River, the Phantom Ranch deep within the canyon and the gorgeous rock formations created by the Colorado River. You can choose to end your hike at the Grand Canyon Village or at Yavapai Point where you will take a short shuttle bus ride back to your coach. Also included on this tour is a free boxed lunch that you can enjoy at your leisure. Your fabulous day at the Grand Canyon concludes with a peaceful ride back to your Las Vegas hotel. An excellent way to view the natural landscape of the Mojave Desert and the Grand Canyon is to try the Grand Canyon South Rim Bus Tour. Your 14-hour adventure begins with free pick-up service from your hotel where you will then ride comfortably through the Mojave Desert while you listen to the interesting history of the American West. 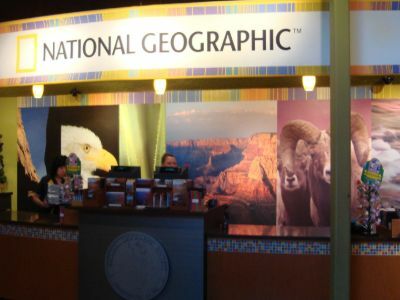 Your first stop at the Grand Canyon is at the National Geographic Visitor Center where you will be thrilled to watch an IMAX movie about the formation of one of the world’s Seven Natural Wonders. From here you will take a short drive along the South Rim where you can take some time shooting photographs at places where the canyon dives over mile deep and dine on a complimentary box lunch. There will be plenty of time to walk along Mather Point and you can take in the historic El Tovar Lodge at the Grand Canyon Village. Your amazing Grand Canyon South Rim Tour concludes with a comfortable ride back to your Las Vegas hotel.